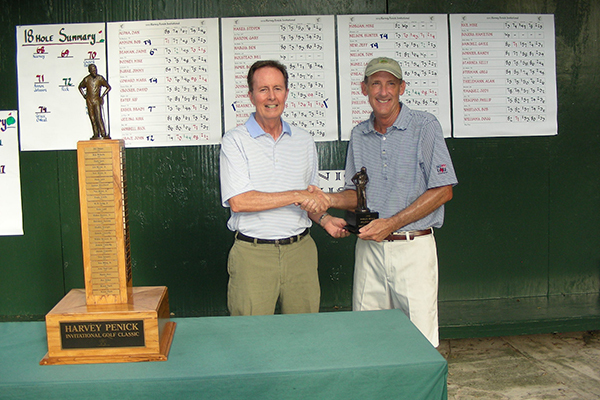 Former champ Bob Kearney wins Senior Division. 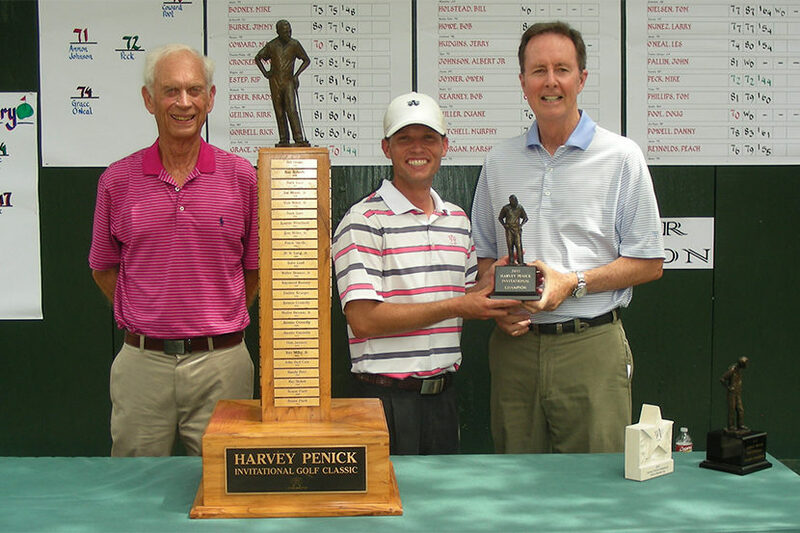 Golf historians will have to look hard to find another instance of a player losing an 8 shot final-round lead and still winning by 8, but that is exactly what happened at the 76th Harvey Penick Invitational at Austin Country Club. Brian Noonan of Austin started the day 8 shots clear of Derek Meinhart of Mattoon, IL and stretched the lead to 9 with birdies on the second and third holes. But seven holes later the lead was gone and Meinhart had somehow pulled even, with birdies on Nos. 6, 7 and 10 allowing him to catch Noonan, who found the water at No. 4, made double bogey, and then bogeyed four of the next five holes. But just as quickly as his lead was lost, Noonan managed to rally and build the lead again. After Meinhart bogeyed Nos. 11 and 12, Noonan rattled off four birdies in five holes starting at the 13th, and when Meinhart tripled the 15th, the tournament was no longer in doubt and the final margin was again eight shots. Both players ended up shooting 74, with Noonan finishing at 8-under 208, and Meinhart tied second with Andrew Lawson of Dallas at even par 216. A three-time winner of the Austin City Championship, Noonan posted a pair of 5-under-par 67s to build his lead after two rounds. He had to overcome a stomach virus on Friday on the way to a two-shot lead after the first 18 holes. Colby Harwell shot the low round on Sunday, a 67, to finish tied fourth with Michael Walton (74) of Indian Wells, CA and Clarke Kincaid (74) of Trophy Club, TX. Bob Kearney of Houston had only a slightly easier time protecting his lead in the Senior division. Leading by four entering the final round, Kearney had to fend off a strong challenge from a number of players, as all five of his opponents in the last two groups shot under-par rounds. Former Walker Cuppers John Grace of Fort Worth and Mike Peck of Irving both shot 68 to post 4-under 212, but Kearney stayed steady and posted a final-round 71 to finish at 6-under 210 for a two-shot win. Hunter Nelson (71) of Houston and Mark Coward (68) of Paradise Valley, AZ finished tied fourth at 2-under 214, and Jaime Beaman of Austin (70) finished sixth at 1-under 215. Kearney becomes the first player to win both the championship (2003, 2004) and senior (2013) divisions. Thanks to all players who participated in the tournament this year. Thanks also to Bobby Stringer and his staff who once again brought the golf course to championship condition. And a special thanks to Tinsley Penick, Harvey’s son and former longtime professional at Austin Country Club whose presence this week made the event that much more special.